Competition in quality of products, which was part of 20th International Exhibition "Prodexpo" (Moscow), was completed on 15 February. Competition Commission represented by SOYUZEXPERTIZA ANO, The Chamber of Commerce of the Russian Federation and Expocentre ZAO summed up the test of consumer properties of competitive products aiming to promote the best examples of Russian products on the domestic and foreign markets. 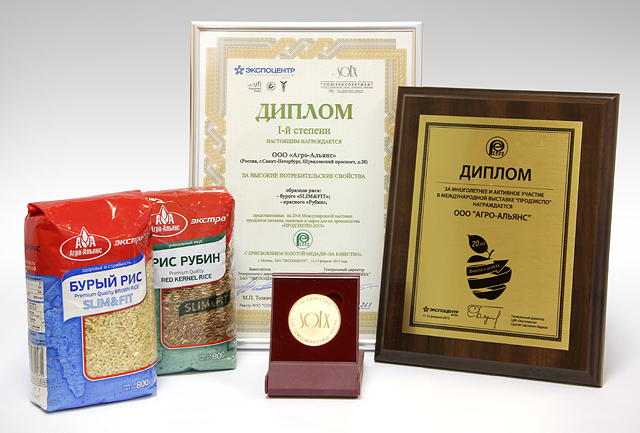 Slim&Fit brown rice and Rubin red kernel rice, which are produced on own facilities of Agro-Alliance holding company in the Krasnodar region, were awarded a gold medal and a first degree diploma for High Consumer Qualities of Products.